East End Arts Council and the Southampton Cultural Center are hosting “The 7th Circle,” a powerful exhibition featuring work by three social and environmental artists who are addressing human impact on the planet and its inhabitants. 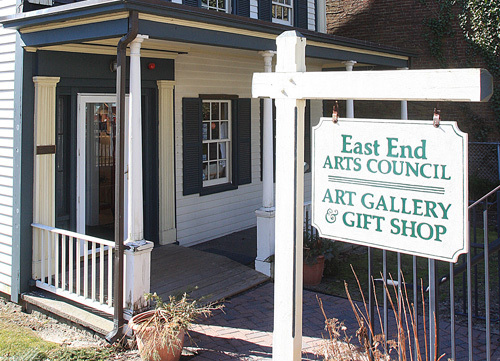 East End Arts in Riverhead announced last week details about its upcoming East End Challenge, a contest that encourages high school students to help preserve the environment. Ms. Carson was a marine biologist and conservationist who wrote “Silent Spring,” a book that has been credited with launching the contemporary American environmental movement. This new exhibit will feature the winning entries of the East End Challenge. All high school students from the five East End townships — Riverhead, Southold, Shelter Island, Southampton and East Hampton — are eligible. Students must first submit an application with an outline and description of their proposed project. Cash prize awards are available of up to $1,000 for winning entries. All finalists selected will receive $100 each. The deadline for entries is March 4. For more information, visit eastendseaport.org/application.htm. The East End Arts Council has announced the nominees of the Ninth Annual Teeny Awards and Shelter Island’s Drew Garrison is among the nominees. The Teeny’s recognize the best in student theater on the East End, with 15 schools having entered this year’s contest. The winners will be announced during a ceremony at Westhampton Beach High School June 5. Vincent Cinque, Westhampton Beach, Is He Dead? Kaela Murphy, Westhampton Beach, Is He Dead? Aidan Marsicovetere, Westhampton Beach, Is He Dead? Christian Thienel, Westhampton Beach, Is He Dead? Bret Tucker, Westhampton Beach, Is He Dead? Jack Hodgens, East Hampton, Oliver! Allison Charde, East Hampton, Oliver! This category was created to recognize a student who “shines brightly” in a role that is not eligible for adjudication in the leading or supporting categories. This award is chosen by the judges in a vote. It is for a particular scene, musical number, dance number, ensemble effort, or group that the judges feel stands out enough to warrant the special merit. This year, the recipient of the Judges’ Choice Award are Mattituck High School Students, led by Colin Keil, Becca Mincieli and Marissa Russo, for campaigning to bring a musical to their school for the first time since 1989. East Hampton, Curran Brierley, I Remember Mama and Oliver! East Hampton, Molly Finnegan, Oliver! This award recognizes the efforts of a school to support theatre arts by going above and beyond the regular high school play. This year, two schools are being recognized for making possible fully student-produced theatrical productions: Ross School and Pierson School. The following announcements from local and regional organizations were released to the Reporter this week. REPORTER FILE PHOTO | The Shelter Island Library is looking for authors for its Book & Author Festival, which was a big hit last July. The second annual Shelter Island Library Book & Author Festival will take place at the library on Saturday, July 9 at 2 p.m.
Local authors with books published between 2009 and 2011 are invited to participate in this benefit event. Proceeds support the renovation of the library’s lower level. More than 40 local authors took part in last year’s popular event. Bishop McGann-Mercy Diocesan Junior High and High School in Riverhead will hold its Annual Principal’s Dinner at Giorgio’s in Baiting Hollow on Saturday, March 12, 2011. This year, McGann-Mercy is proud to honor Kevin O’Connor, President of Bridgehampton National Bank who will receive the Principal’s Award, Father Henry Leuthardt ‘79, Pastor at St. Joseph’s Roman Catholic Church in Ronkonkoma who will receive the Catherine McAuley Award, and Dr. Steven Cheeseman ‘89, Associate Superintendent of School for the Diocese of Rockville Centre. Proceeds from this year’s event will go to the McGann-Mercy Tuition Assistance Fund. Approximately 20% of Mercy families received some type of tuition assistance for the 2010-2011 school year. The availability of funds depends on donations; requests for assistance for the upcoming school year have more than doubled. At this time, there are simply not enough funds to assist all the Mercy families in need. For sponsorship information or to purchase tickets to the Principal’s Dinner, please call the Development office at 631-727-5900 ext 21. Located in Riverhead, New York, it is the mission of Mercy High School to provide an environment in which all students are challenged and inspired to achieve their personal best. With approximately 500 students in grades 7-12, the school’s uniquely small Catholic community, with its enriching and supportive environment, has its roots in the religious traditions of the sisters of Mercy and the Catholic faith. The administration, faculty and staff are dedicated to teaching students to live morally, responsibly, and productively. Distinguished by the United States Department of Education as a National School of Excellence, McGann-Mercy is committed to preparing leaders for tomorrow. Janice Huff, chief meteorologist for WNBC in New York City and host of “Wednesday’s Child,” a weekly adoption television feature that airs Wednesdays (and Sundays) on NBC, will be the guest speaker at the 12th annual Valentine Salon. Once again, Juliet Papa of 1010 WINS News Radio will emcee the event. The Valentine Salon is a luncheon that helps raise money and awareness for Camp Good Grief, a children’s bereavement summer day camp located on Long Island and sponsored by East End Hospice. The camp is offered free of charge to any child aged 4 to 15 who has experienced the devastating loss of a loved one. The luncheon will be held on Wednesday, February 9, 2011 from 11:15 am. until 2 p.m. at 583 Park Avenue, New York City. “Eat, Give, Love” is the theme of this year’s event, which attracts over 200 local women for a fun-filled afternoon of shopping, networking, fundraising and most importantly, awareness for Camp Good Grief. Barbara Zobian, president of Candlelighters, NYC, a branch of the national organization that supports families of children who are battling cancer, will receive this year’s “Good Heart Award.” The award is given to women who have demonstrated an extraordinary commitment to helping children. Jacalyn Weinstein, East End Hospice board member and event co-founder, will present this prestigious “Manfredi created” award to Ms. Zobian. East End Hospice is a New York State certified hospice that provides individualized plans of treatment to terminally ill patients and their families who live on the East End of Long Island. No one is ever denied care due to the inability to pay for services. Tickets begin at $200 and are available through the East End Hospice Development Office at 631-288-7080 or at eeh.org. Tables and sponsorships are still available; please call the office for details. The Animal Rescue Fund of the Hamptons, Inc. (ARF) will participate in Spay Day, a national campaign of the Humane Society of the United States (HSUS), to promote the life-saving benefits of spay/neuter. A week-long clinic offering free or low cost spay/neuter surgeries for pets of needy families in East Hampton, Southampton and Shelter Island will take place the last week of February. Millions of homeless animals are euthanized each year in the U.S due to over population. Spay/neuter helps to reduce this problem, lessening the burden on our town animal shelters and the taxpayers as well as protecting pet health and improving pet behavior. A special deal is being offered for Pit Bulls. ALL Pit Bulls will be spayed or neutered FREE of charge. Owners must be a resident of one the three towns, but proof of financial hardship does not need to be demonstrated. Also all eligible cats will also receive a FREE microchip. To find out if you qualify, please call ARF at 631-537-0400 ext. 207. Each case will be reviewed individually and appointments must be made in advance. The Animal Rescue Fund of the Hamptons was founded in 1974 and is the leading animal welfare organization on the East End of Long Island. Each year we take in over 800 cats and dogs and during their stay provide nutritious food, exercise, a warm place to sleep and excellent veterinary care in our state-of-the art Adoption Center. ARF is dedicated to finding loving homes for our precious cats and dogs not only to improve their lives but also the lives of the people who adopt them. ARF is located at 90 Daniels Hole Road in Wainscott. For more information, visit the ARF website. The East End Tourism Alliance is doing what it promised, working to drive tourism traffic in the off season with creative internet based marketing twists to support regional tourism and add more consumer value and fun to the Winterfest 2011 program. The 2011 Long Island Winterfest – Jazz on the Vine weekend events, February 11 to March 20, are organized by the East End Arts Council and the Long Island Wine Council, with assistance from the Suffolk County Department of Economic Development under the auspices of the Office of Film & Cultural Affairs, the Long Island Convention and Visitors Bureau, as well as support from Hotel Indigo, Cross Sound Ferry, Teatro Experimental Yerbabruga and Peconic Public Broadcasting. For more information on Winterfest programs, click here. EETA is the 2011 Program Ticket sponsor, visitors attending this year’s events at the participating wineries will pay a $10.00 admission fee for special events at the wineries. In return, they will receive a commemorative Winterfest 2011 Jazz on the Vine two part ticket that will entitle the ticket holder to both a free glass of wine and the opportunity to win one of the weekly eastendgetaway weekend packages if their ticket number matches the weekly winning ticket number posted on eastendgetaway.com each week. East End Getaway is also hoping to build awareness and more participation through a Facebook challenge, every time 50 new friends “like” eastendgetaway.com on facebook, a winner is randomly chosen among all of Eastendgetaway.com’s friends for two free tickets to Winterfest! The weekend getaway packages include overnight accommodations at Hilton Garden Inn, Holiday Inn Express, Jedediah Hawkins Inn, Enclave Inn, Heron Suites, Hyatt Place East End, Hotel Indigo, gift certificates for Vintage Tours, Navy Beach and Southampton Publick House, 2 tickets to Atlantis Aquarium, a wine basket and a welcome gift bag from Tanger Outlets. The weekly winning ticket number will be posted each Tuesday throughout Winterfest between Feb 18 and March 25.